The popular story about Chile, as told in the Commanding Heights video and elsewhere, has “The Chicago Boys” helping dictator Pinochet to overthrow Marxism and quickly establishing a growing free-market, small-government paradise. Even today, the free-market fundamentalists tout here and here and here that the Chicago Boys and the free-market ideology is responsible for Chile having a lower death toll from their recent earthquake than Haiti experienced. Balderdash. First off, I’m amazed that in the rush to congratulate Milton Friedman for “saving” so many Chileans from dying in the earthquake, that the free-market ideologues don’t consider population density. Haiti is the world’s 30th most densely populated country. Chile is 192. Any earthquake that hits a densely populated area kills more than one in a less dense area. Duh. see Wikipedia. Second, Chile’s current wealth/income and strong building codes are not exactly the result of what the Chicago Boys preached. Things like 20% of Chile’s national income coming from mining, which in turn is dominated by a state-owned enterprise: Codelco. Or, that Milton actually hated building inspectors and considered building codes as an unnecessary tax on property owners. Ah, Chile. Remember how, during the Social Security debate, Chile’s retirement system was held up as an ideal — except it turned out that it actually yielded very poor results for many people, and the Chileans themselves hated it? Now we have the usual suspects claiming that Chile’s relatively low death toll in the quake proves that — you guessed it — Milton Friedman was right. You see, the Chicago Boys made Chile rich, and that’s what did it. As a number of people have pointed out, there’s this little matter of building codes. Friedman wasn’t exactly fond of such codes — see this interview in which he calls such codes a form of government spending, because they “impose costs that you might not privately want to engage in”. But there’s another point: the economics of Chile under Pinochet are a lot more ambiguous than legend has it. The way the story is told now, the free-market guys moved in, liberalized, and then there was a boom. Actually, as you can see from the chart above, what happened was this: Chile had a huge economic crisis in the early 70s, which was, yes, partly due to Allende and the accompanying turmoil. Then the country experienced a recovery driven in large part by massive capital inflows, which mostly consisted of making up the lost ground. Then there was a huge crisis again in the early 1980s — part of the broader Latin debt crisis, but Chile was hit much worse than other major players. 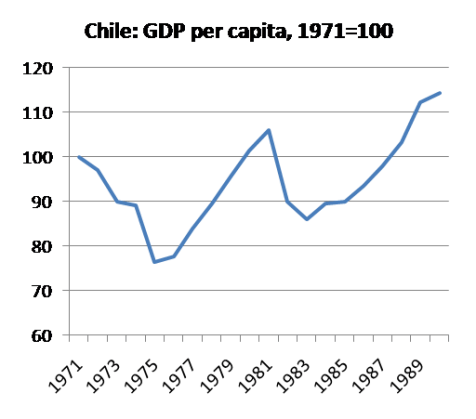 It wasn’t until the late 1980s, by which time the hard-line free-market policies had been considerably softened, that Chile finally moved definitively ahead of where it had been in the early 70s. So: free-market policies are applied, and presto! prosperity follows — fifteen years later.